Numismatists around the world have been excited by the news that an incredibly rare petition crown is to go on sale in New York for an estimated £400,000. The sought after coin comes on the market once in a blue moon and always generates lots of interest, a sale in 2007 made £207,100, then a record for a British silver coin. Considered to be one of the finest examples of coin engraving in British history, the petition crown has a heritage and rarity that would make it the prize in any collection. The Dutch referred to by Simon are two Flemish brothers, John and Joseph Roettier, who had been appointed as chief engravers by the King. The design for the new coin became a competition between the brothers and Simon, with all three hoping to gain the chance to mint coins for the new monarch. The masterpiece of coin art that Thomas Simon created used revolutionary new techniques to fit his 34 word inscription around the edge. At the time it was considered a marvel of engraving craftsmanship and superior to anything that had come before. All of Simon’s hard engraving work came to nothing however when, in 1662, his design was passed over for that of John and Joseph. Together with Peter Blondeau, the two brothers had won the warrant to mint their crowns. 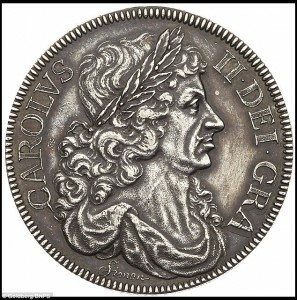 Despite this setback, Simon continued to work closely with Blondeau and remained at the Royal Mint until his death in 1665. As a result of his unsuccessful petition, examples of Simon’s crown are now immensely rare. Only 16 are believed to exist and the one up for sale in January in New York is one of the top three best preserved examples. It is to be sold by Goldberg Auctioneers as part of the New York International Coin Auction and is certain to be one of the most sought after and expensive lots in the 3 day auction. This entry was posted in Able News and tagged coin, engraver, engraving, inscription, metal on 24th January 2018 by admin.